Animal photographer and tireless globetrotter, Tony Crocetta has been travelling all through the world for about twenty years and has hunted down everything that was swimming, running, crawling or flying on earth, through his lenses. Brought-up in the Parisian suburb, he discovered animals in black and white on the unique TV channel of that time and took great delight in watching Christian Zuber’s animal reports dreaming of further horizons. When he turned professional, he devoted himself to realizing animal reports in the all world. Its awareness for environment rose quickly and he’s now involving in a demonstrating association called ”Noe conservation” whose mission is the conservation of threatened animal and vegetal species and of which he is one of the co-founder. 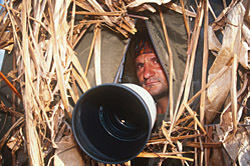 He is also an organizer for photographical and ornithological safaris in Kenya. His work is often published in the most prestigious press magazines in France and abroad. And, of course, his pictures are distributed by the Bios agency, and that’s not the least one can do!